With 63 Episodes over 6 Seasons original Aired from 1997 to 2001 this animation was a surreal adventure! Norbert and Daggett are two fun loving beaver brothers, who had to leave home when their mum had a new litter. Now in their own chill palace of a home, Norb and Dag can stay up as late as they want, watch late night movies and eat what they want, but living on your own isn’t always a blast. Like most brothers Dag and Norb are close and have their fair share of ups and downs. 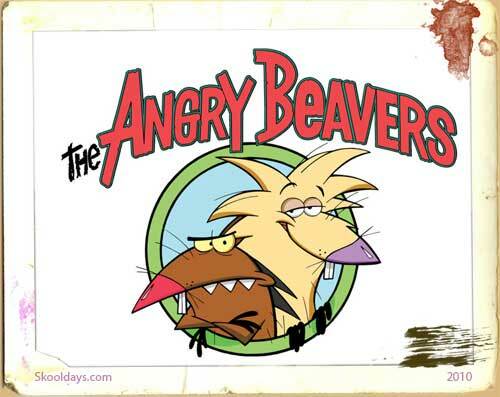 When they’re down they sure are a couple of Angry Beavers! Recently the angry beavers dvd set was released – though its not always easy to get hold of. We notice Amazon don’t currently stock the angry beavers box set yet. The episodes are hilarious (especially the Muscular Beaver ones), and the characters are laugh out loud funny! I like Dagget because he’s real stupid, and says a lot of funny stuff (like spoot-head). Norbert’s funny because of his personality, and how he says words in a different kind of way. It just gets me going!!!! It’s also funny because they watch B-movies like the Crawling Spleen which was pretty funny! Gift Hoarse / Go Beavers! The Bing That Wouldn’t Leave / You Promised! Trees Company / Guess Who’s Stumping To Dinner? Kandid Kreatures / Fakin’ It! My BunnyGuard / What’s Eating You? Omega Beaver / Bite This! Kreature Komforts / Oh, Brother? Nice & Lonely / Soccer? I Hardly Knew Him! Chocolate Up To Experience / Three Dag Nite! It’s A Spootiful Life / The Mom From U.N.C.L.E. This entry was posted in Cartoon, Saturday and tagged 1990 by Skooldays. Bookmark the permalink.